As we chatted, the shop keeper took this platter from the cooler case below and gave me a deep purple tomato from Hokkaido to sample. Tomatoes taste much better when unrefrigerated. 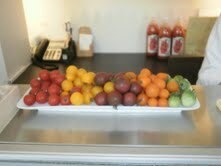 Move over square watermelon and make room for this tomato gift assortment. 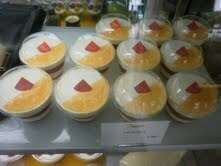 It is so pretty -- the colors, the round form and the artful assembly -- it would almost be a shame to eat it. Probably not a problem. 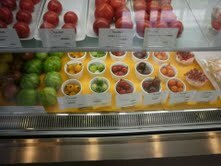 Little cups containing different types of tomatoes from all over the country. Tomato Tiramisu. I kid you not. Layers of house-made tomato jam sweeten the concoction but I have to like the idea of what I am eating. And this is a bit outside my comfort zone. 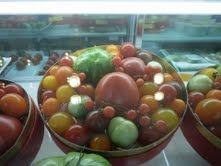 Tomato Roll Cake? Let's not even go there. 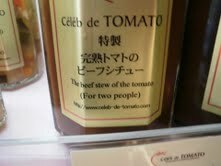 A more conventional offering for home use: Beef Stew of the Tomato (for two people). 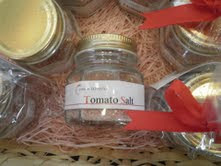 Table salt mixed with dried, pulverized tomato skin. 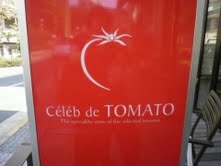 I could not leave without buying this for the tomato lover.